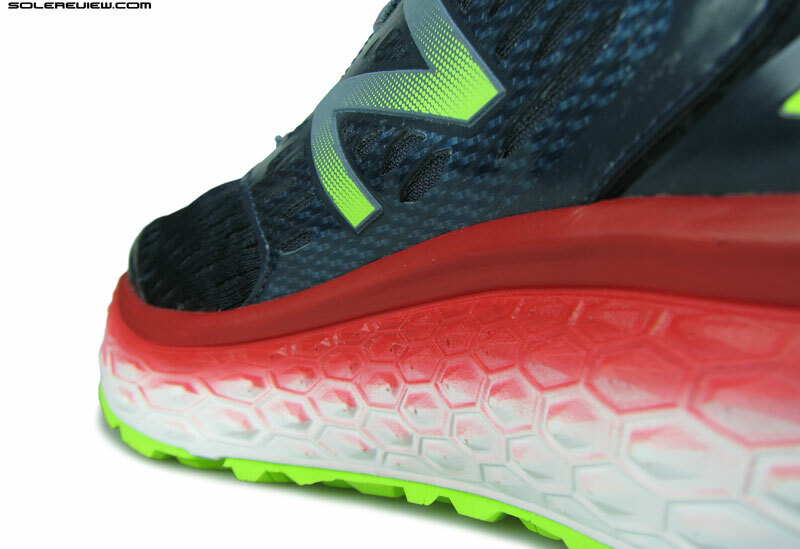 New Balance’s marketing pitch: The newest Fresh Foam 1080 gives you even more cushioning than before. Upper: Engineered mesh, inner sleeve, synthetic leather, molded urethane toe-cap. Midsole: Single density, compression-molded EVA foam. 8 mm heel offset. Outsole: Hard carbon rubber under the heel edge, softer blown rubber under the mid and forefoot. Minor updates maketh the 1080 V7. There’s some newness in the upper, midsole and outsole design, and the ride quality remains the same as the V6. When a well-known shoe series like the 1080 goes through a drastic transformation, a sensible course of action would be to change the name. 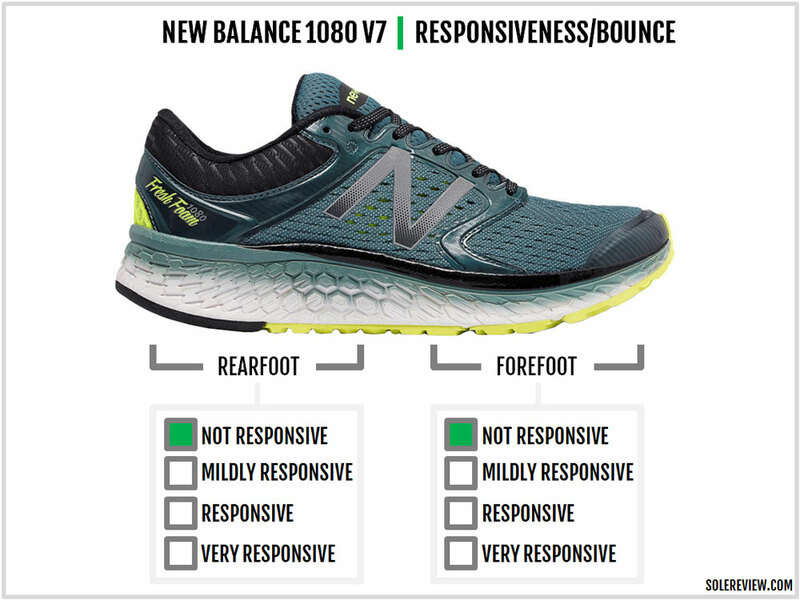 But instead, New Balance chose to add a V6 suffix to the last year’s 1080. Many runners were caught unawares by how removed the ‘new’ 1080 was from its previous version; except for the name, everything else was brand new. Be it the quality of upper fit or the midsole ride, there wasn’t a shred of similarity with the outgoing 1080 V5. It didn’t help that the overall package reeked of mediocrity. The upper interior had a bothersome seam, and the Fresh Foam midsole felt uninspiring and clinically boring. Relative to the marketing hype, New Balance’s Fresh Foam platform has been a disappointment from the very day of its release. 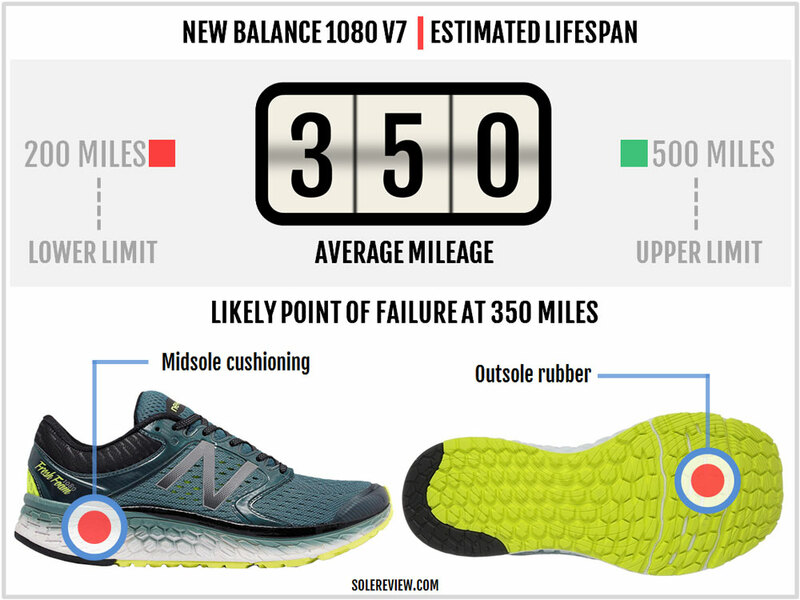 The Fresh Foam 980 was unimpressive when we tested it, and it was only saved by the thick Ortholite insole which provided a layer of soft cushioning. Here’s the universal truth about new midsole materials: If a novel cushioning technology is really good, then it will shine regardless of how it has been utilized initially. Think adidas Boost or Saucony Everun. The first Boost shoe – the Energy – might have been overly soft, but the material showed promise with its superlative quality of cushioning. The Everun, for all its meager ‘topsole’ and crash pad servings in the Triumph ISO, showed a glimpse of its future potential. On the other hand, cushioning ‘tech’ like the Saucony Powergrid+ was a letdown from the very start. After a year, the Powergrid+ midsole was banished into obscurity, never to be heard from again. The Fresh Foam midsole is of the same kind. It was never great to begin with, and that’s the sorry truth. Some hope came in the form of the Fresh Foam Zante V1 and the Boracay, where a softer and thinner midsole helped produce a cushioned and responsive ride. But except for stray cases, Fresh Foam has limited potential and is a weak defense against the formidable likes of adidas Boost, Saucony Everun or Nike Zoom. 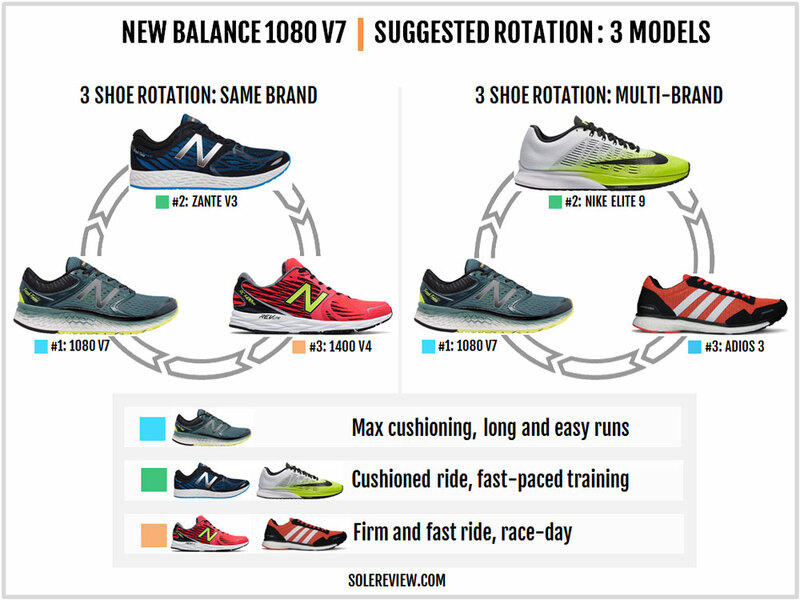 The New Balance 1080 V7 is very much like the 1080 V6. The upper fit and feel is similar, and so is the thick foam midsole attached underneath. There are a few updates made throughout but nothing major. The New Balance 1080 V7 belongs to the premium neutral cushioning class, a product tier where brands cram in as much cushioning and plushness they can into the shoe. The price-band of $140 – $160 gives footwear designers and developers more leeway to tap into a wider menu of upper materials and cushioning tech, something which is difficult to do in lower priced models. Things haven’t been the same for the adidas Supernova Glide ever since the 9th version made it to the market. By eliminating the firmer EVA midsole layer and increasing the volume of Boost foam, the Glide became a lot softer than previous models. On paper, the adidas Glide belongs to a segment populated by shoes like the Saucony Ride, Asics Cumulus, and the Nike Pegasus, but recent developments concerning the midsole has upgraded it to a higher cushioning segment. So that makes the Glide’s $130 MSRP cheapest of the lot, followed by the $140 Nike Vomero with its two-Zoom Air bags and Lunarlon arrangement. The Nimbus 19 is Asics’s premium trainer, now made firmer by the Flytefoam midsole. The Brooks Glycerin 14 is similar to the 1080 V7 in a way. 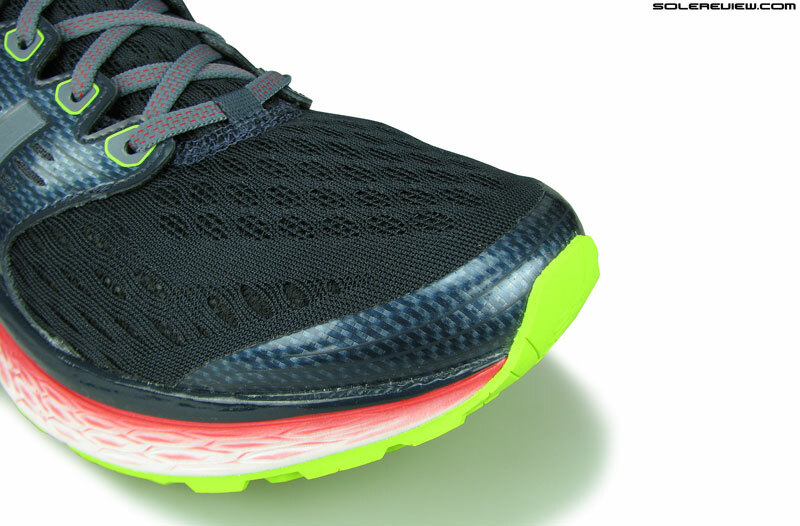 The Brooks SuperDNA foam base isn’t exciting to run on, and all it offers is a padded ride expected of a foam midsole. Which is exactly what the 1080’s Fresh Foam does too. 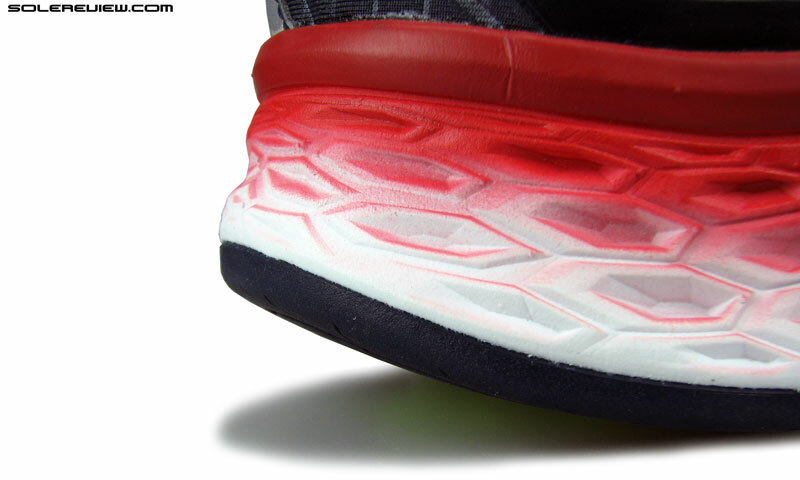 The Saucony Triumph ISO 3 has a partial infusion of Everun foam. It has a rearfoot Everun crash-pad under an additional layer of Everun topsole, a design which produces a responsive and supportive ride. There are merely three updates worth highlighting on the V7’s upper. One, the structure of the engineered mesh has changed. The weave is denser than the fabric used on the 1080 V6; whereas the latter had a more open surface, the 1080 V7’s mesh is packed tighter. The second update is applied to the midfoot panel. The 1080 had large synthetic leather panels on both the sides with a perforated surface, which is now replaced with a design favoring the use of engineered mesh within a synthetic leather boundary. 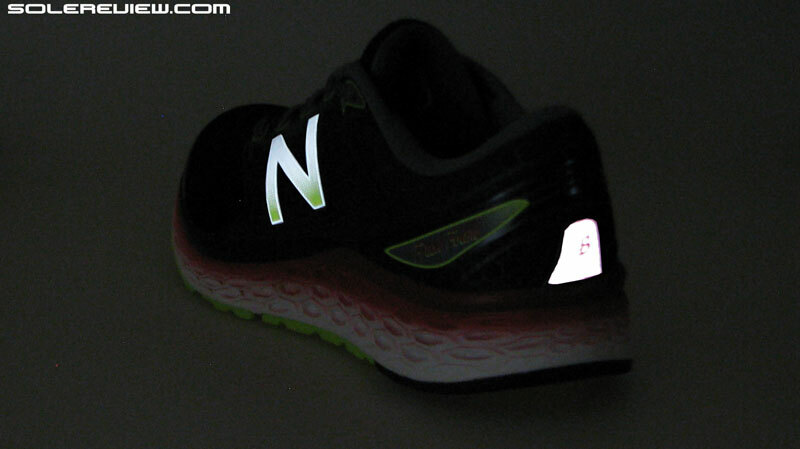 The New Balance logo in the shape of a large ‘N’ stays reflective, as they were on the 1080 V6. Lastly, the molded toe-cap receives a minor tweak. While the design basics stay the same – the bumper is molded out of hard, thin urethane – the sides are higher than the V6’s toe-cap. There are other small changes. The usage of the synthetic leather might have decreased on the midfoot, but it increases over the rearfoot. The midfoot panel extends to the heel, where it wraps around the shoe. Some molded detailing and printed text are also thrown in for good measure. The lower part of the heel is still reflective, except that the shiny trim is partially obscured by mesh. 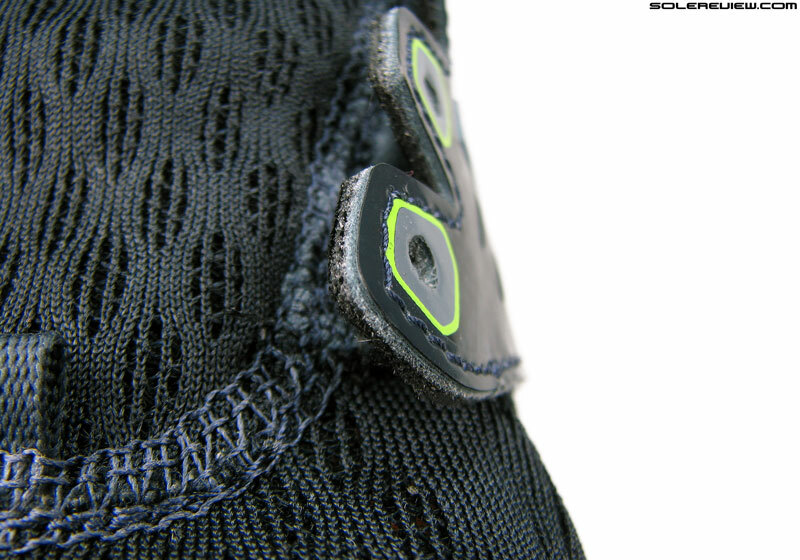 Inside the shoe, there’s a sleeve which attaches the padded tongue to the sides. This design is identical to the V6, which also means that there’s a seam inside. We found this seam to be a minor irritant on the V6, and unfortunately, it is so on the V7 too. 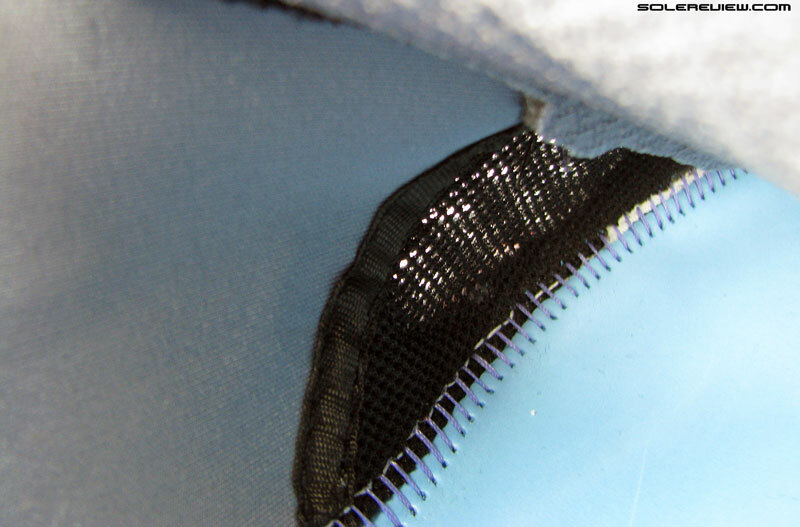 We understand that the stitching (and the seam) exists because of the inner sleeve. The lining which forms the sleeve does not extend right up to the toe, but ends where the midfoot and forefoot meet. This joint creates the seam we speak of. The 1080 V7 keeps the same semi-stretch laces used on the V6, though there’s a loop missing under the first lacing row. And the synthetic leather usage might have decreased over the midfoot panel, but the lacing eyestay remains a thick bunch of materials. The heel lining and foam padding are similar to the 1080 V6, so not a lot of change to talk about there. The 1080 V6’s redesign brought with it a midsole in a distinctive rocker shape. When viewed from the side, the thick midsole had a noticeable heel and toe spring, which was different from the V5’s relatively flat midsole profile. 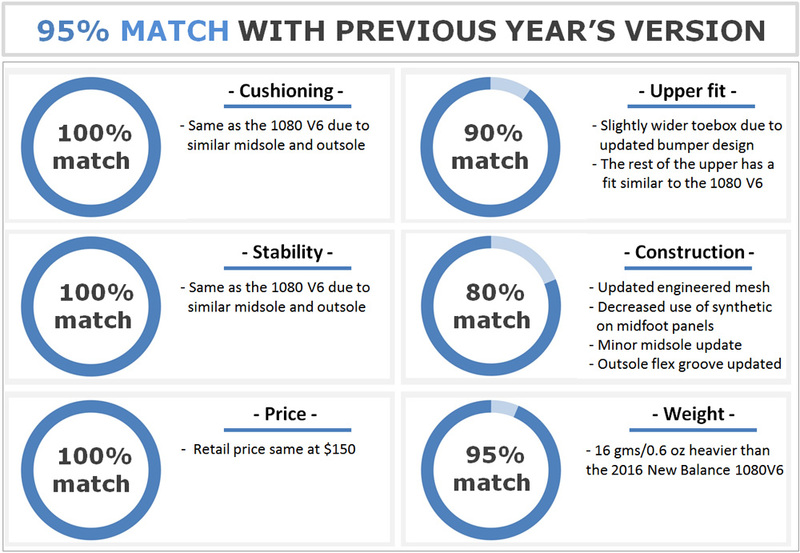 This year’s 1080 V7 has a similar design language as the V6 not only in terms of the rocker-profile, but the midsole and outsole design as well. The outer sidewall is molded over with concave (inwardly curved) hexagons, while the inner midsole has convex (outwardly curved) hexagons. This is made so to make the medial midsole more supportive. Like the past model, the Fresh Foam midsole is made of single-density EVA foam stacked in a 8 mm gradient. There are no inserts of any kind. 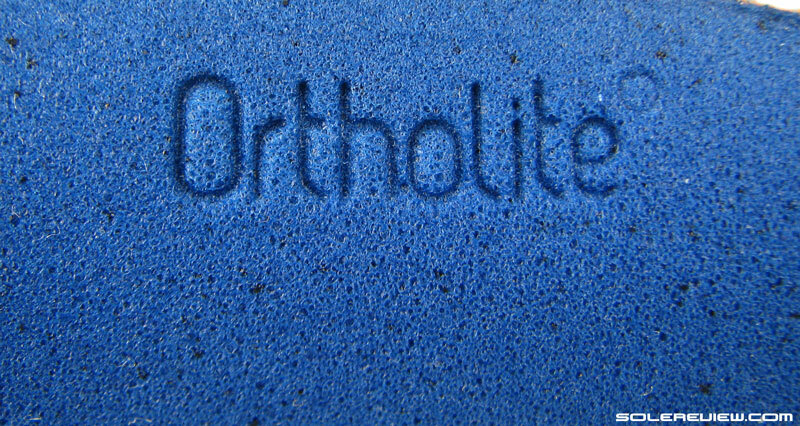 At the top (inside the upper) is a plush Ortholite insole, followed by a sheet of foam lasting underneath. The outsole is a two-piece layout of soft blown rubber and a harder compound. The heel edge is protected with a hard rubber strip in a horseshoe-like shape, and the rest of the surface has a softer kind of rubber. While this geometry is similar to the 1080 V6, there are a few minor updates, including the ones on the midsole sidewall. The hexagonal rubber lugs have a slightly different shape on the V7, and the flex grooves under the forefoot are straighter, leaving the zig-zag pattern behind. Also, the piece of the forefoot rubber now has elongated slits exposing the foam below. 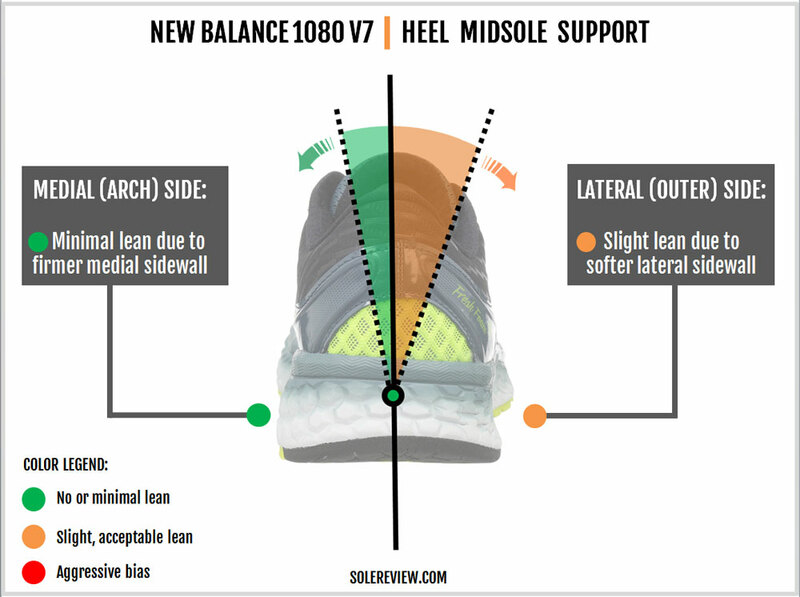 However, this does not significantly impact the midsole flexibility, as the new 1080 stays a stiff shoe. And like the V6, the outsole has an ultra-wide footprint which spans wide across both the forefoot and heel. For some reason, the V7 is heavier than the previous model by 16 grams/ 0.4 ounces. Not that it is noticeable during runs, but we thought that trimming down the upper synthetic should have resulted in weight savings, and not have the opposite effect. Expect reasonable durability from the 1080 V7, as there are no parts likely to fail prematurely. The upper mesh is thick, and the outsole has full rubber coverage. Both of these should deliver a lifespan which is at least at par with the industry median. Long term wear and tear will occur on the blown rubber outsole, which will also be accompanied by a gradual loss in the midsole’s cushioning quality. 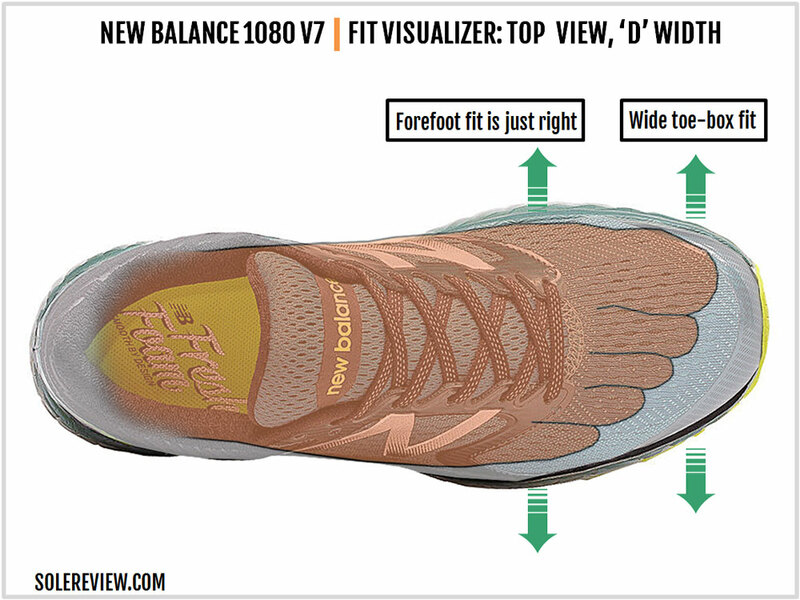 Inside, the 1080 V7 fits nearly identically as the V6 except for a slightly wider toe area. The toe-box has enough vertical room, thanks to the molded bumper. The midfoot fit is in need of design improvement, though. The stretchable inner sleeve provides an otherwise secure and smooth feel, but the inner seams spoil the picture. The seam tapes inside the upper feel bumpy, and this is a surprising design faux-pax for a company whose USP has been superior fit. The lower versions of the 1080 – namely the 880 V6 and 680 V4 – have fused midfoot panels and a smoother interior. With the 1080, it’s not so much the last, but rather an imperfect gathering of components and seams. While one could argue that neither the 880 or 680 have an inner sleeve (and hence no seam required to attach the sleeve), brands like Nike do the whole inner sleeve thing very well without using any seams. The heel area grips similarly to the V6, which is predictable given a near-identical confluence of the heel lining and foam fill. There’s a just-right amount of room on the forefoot sides. The engineered mesh might have gained increased structured compared to the 1080 V6’s easy-going mesh, but that does not result in any form of tightness. With an increase in the height of the molded bumper follows an increase in toe-box width. There’s more space around the toes than the 1080 V6 owing to this minor design update. 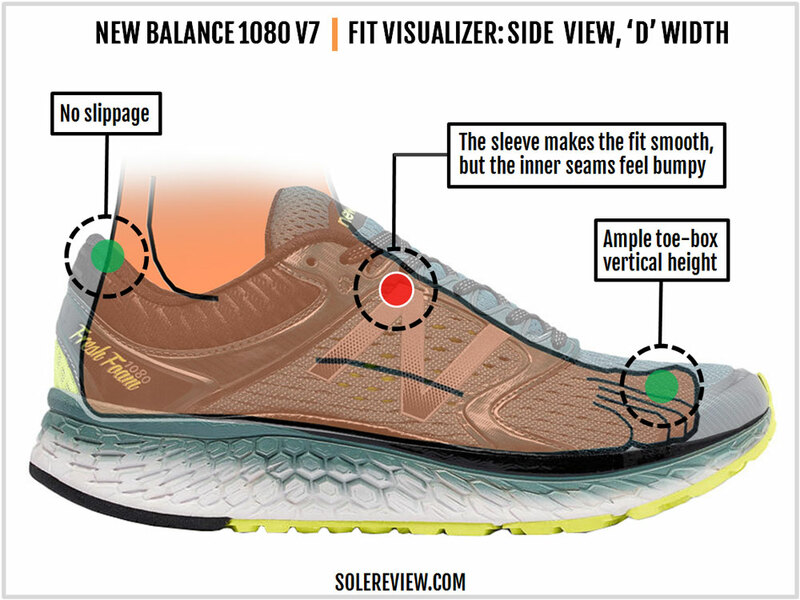 There are two levels of cushioning on the 1080 V7. The first comes from the plush and thick Ortholite insole; the second is the compression from the Fresh Foam midsole below. If you ask us, the Ortholite insole is what contributes to the bulk of the 1080’s soft feel. Take that away, and you’re left with a firm and ordinary ride. This doesn’t mean that the 1080 isn’t cushioned. It has foam padding in plenty, and of good depth too. As such, the 1080 will make a fine long-distance hauler capable of running marathons. It is just that the V7 makes a feeble case for itself when compared to cushioned stalwarts like the adidas Glide and Nike Vomero. Even the part Everun, part foam Saucony Triumph ISO 3 has a leg-up over the 1080. The 1080’s foam midsole lacks the bounce or springiness which people have now come to expect of a running shoe. More so now, in the face of adidas Boost and Saucony Everun. A simple compression of midsole foam is what you’ll get with the 1080, and nothing else. One of the things which the 1080 V7 does well is efficient roll-offs. Let us explain. The midsole has a rocker-like shape combined with a stiff forefoot. This quickens the process of toe push-offs, as the curvature of the midsole allows the foot to roll off faster. The single density midsole also produces consistent transitions, and this quality is also helped by the somewhat firm nature of the Fresh Foam midsole. Hoka does this thick midsole and quick transition trick very well, and you know what they say about imitation being the best form of flattery. The 1080 performs well on stability. The wide outsole footprint and the firm midsole produce a planted and assuring ride quality. Also, the visual thickness of the midsole is an exaggeration. The sidewalls extend higher than the actual midsole stack, which means that the midsole partly cups the foot in a cradle-like fashion. Under the arch, the 1080 V6 had a curved slope which was felt during runs. The V7 rectifies this to a certain extent, making the ride more comfortable. There’s a minor difference in sidewall design which makes the outer (lateral) midsole slightly easier to compress than the firmer inner (medial) side. This has no adverse effect on the overall stability, though. 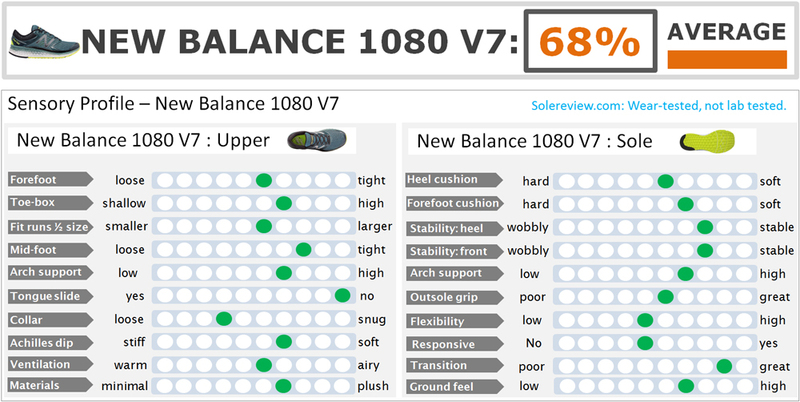 The 1080 V7 is reasonably supportive for a cushioned neutral shoe. Except for the bumpy inner seam, there’s nothing else worth highlighting in a structurally negative sense. 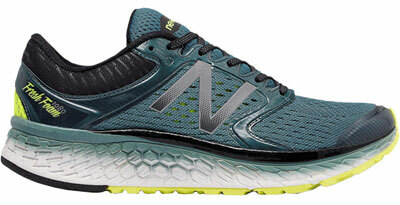 As a stand-alone running shoe, the New Balance 1080 V7 is a well-rounded performer. 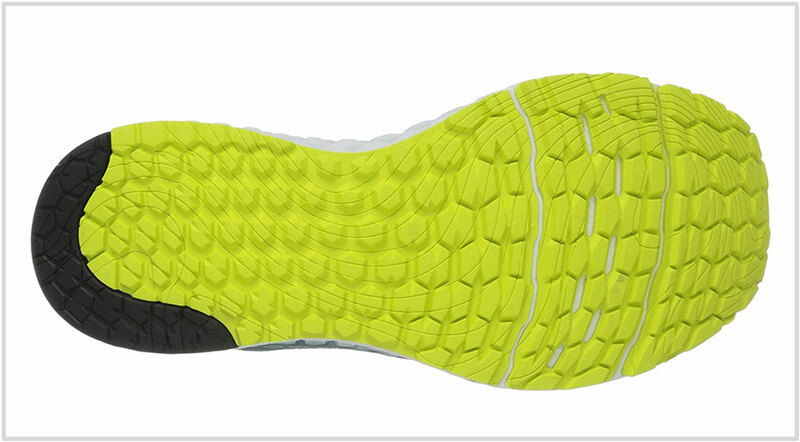 The midsole offers deep cushioning, and the wide outsole provides a supportive base. The inner sleeve does hold the midfoot well, and the molded toe-bumper creates enough toe room, both sideways and up. Transitions feel smooth and quick, courtesy of the single density midsole made in a rocker shape. The hexagonal lugs spread over the rubber outsole grips well. There’s reflectivity in plenty in the shape of the midfoot ‘N’ logos and the heel insert. The 1080 V7’s biggest crime is that it is a boring shoe. Running in the 1080 feels like a chore, and not the plushness, responsiveness, or any other form of awesomeness expected in a shoe with a $150 MSRP. The 1080 is suitable for long races and unhurried training runs. But what works well in one area does not necessarily do so in another, and this is why you’re better off with a few rotational options. For fast-paced training and even races up to a half marathon, the much lighter yet cushioned Zante V3 is a solid pick. 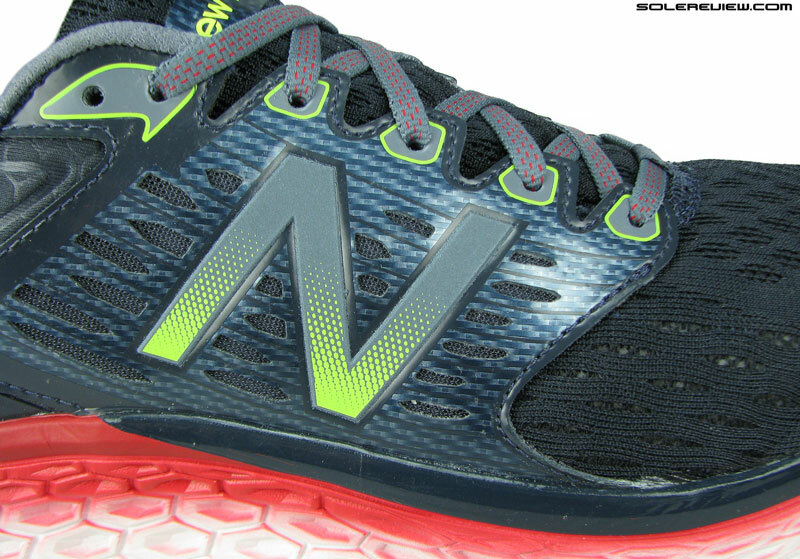 For shorter races of 5K, 10K, and speedy track bursts, consider the 7-ounce 1400 V4. There are a couple of multi-brand alternatives worth trying. The recently reviewed Nike Zoom Elite 9 is lightweight and padded fast trainer which adds supplementary value to the 1080 V7. For race day use, the adidas adios 3 Boost is a no brainer. 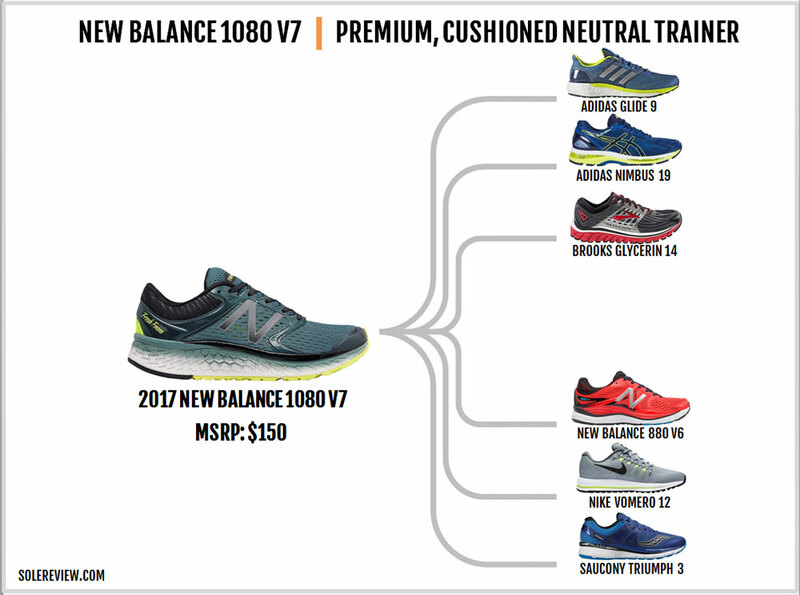 Shoe for shoe, the 1080 V6 and V7 are closely matched. The similar midsole and outsole design lead to a corresponding sameness of ride quality. 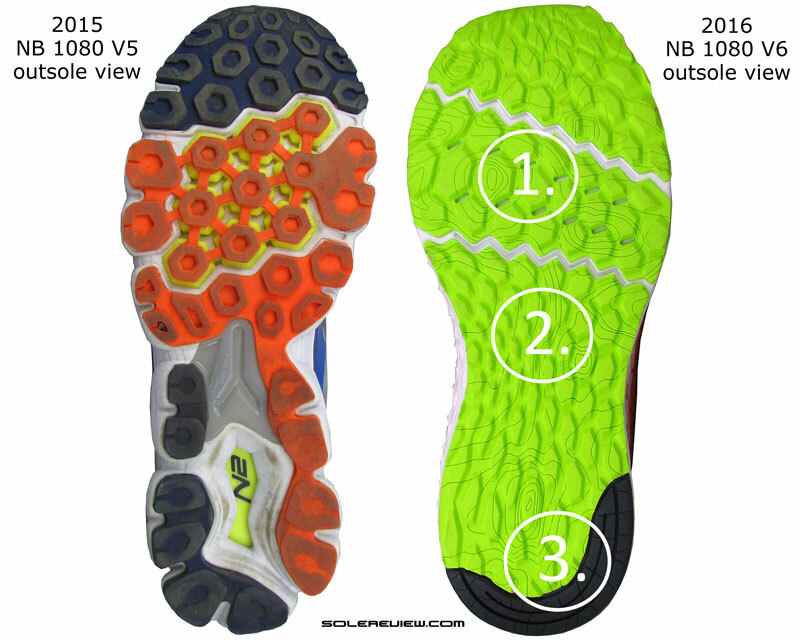 The cushioning, responsiveness (or the lack of), and stability levels are identical to the 1080 V6. The weight has increased by 16 grams/0.6 ounces, however. The similarity extends to the upper fit too. 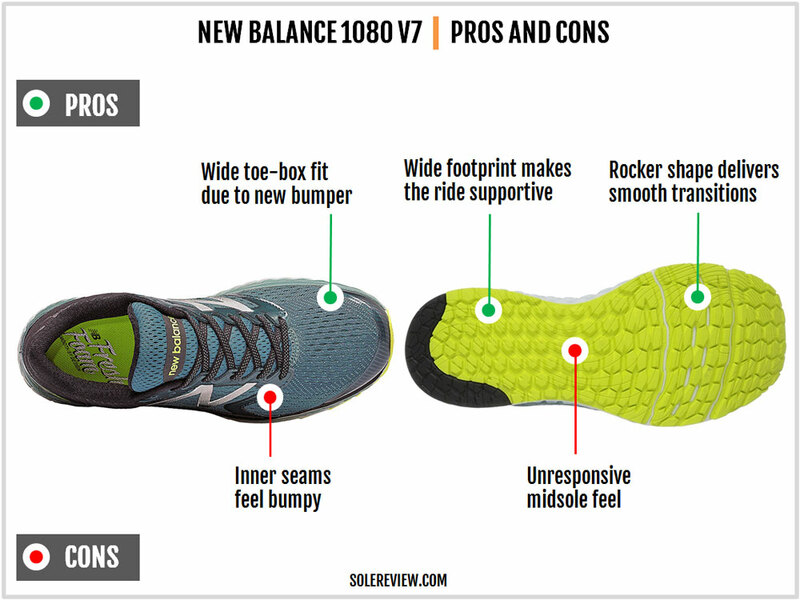 Except for the wider toe-box (which is due to the updated bumper), the rest of the 1080 feels unchanged. There are minor updates made to the engineered mesh and midfoot panels, but their collective impact on the fit, if any, is unnoticed. 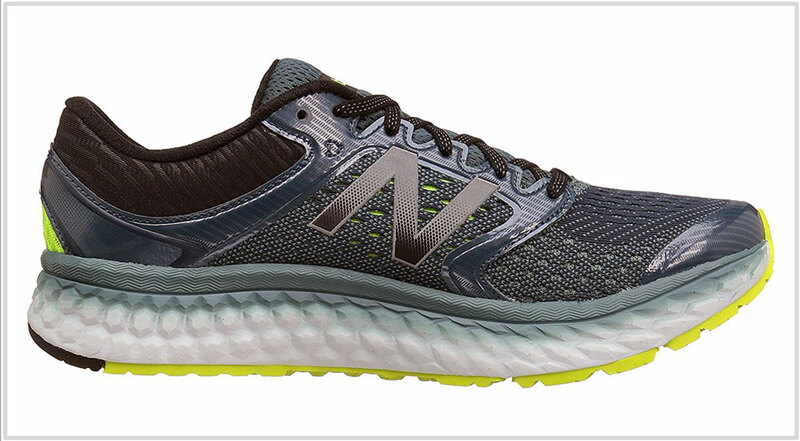 There are lower priced options in the same neutral cushioned family, but they do not feature a Fresh Foam midsole. 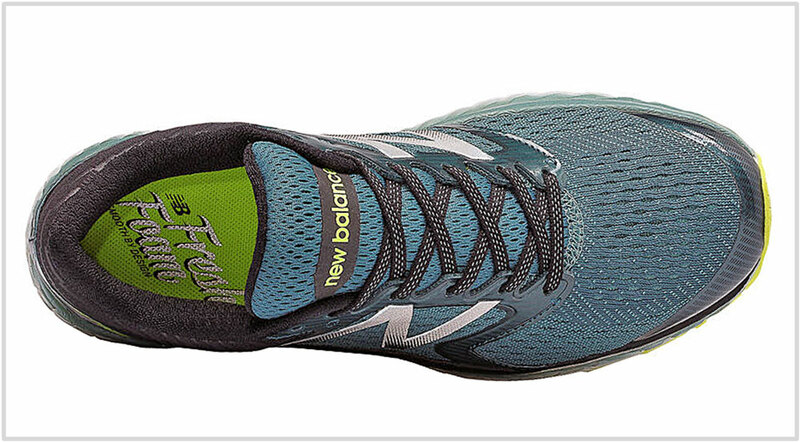 The New Balance 880 V6 is a $30 cheaper alternative with a traditional design. The midsole is dual-density, stacking two different kinds of foam together from heel to toe. The outsole uses softer blown rubber under the forefoot and a harder compound at the back. The 880’s engineered mesh upper has a lot of no-sew stitching, and the tongue is sleeve free. In a lot of ways, the 880 V6 feels like the 1080 V4 and V5. The under-heel cavity delivers a rearfoot loaded cushioning reminiscent of the older 1080 models, and the upper feels familiar too. 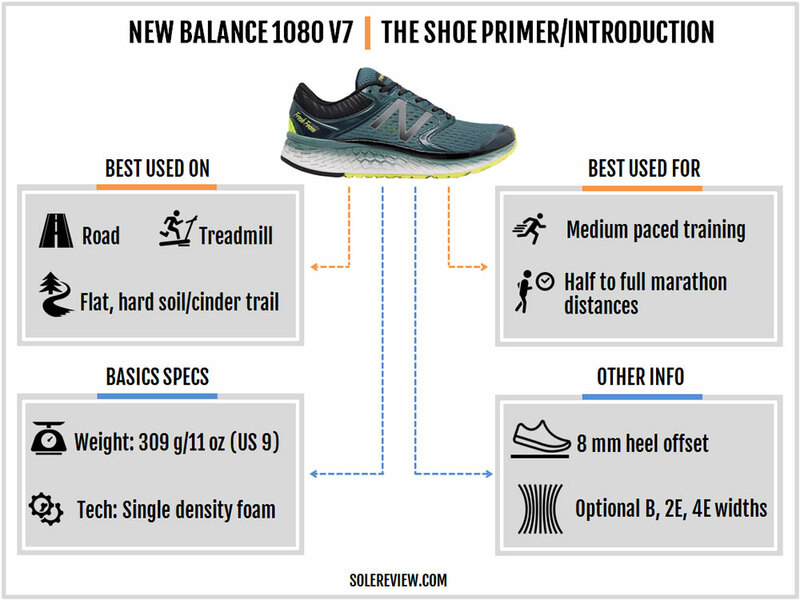 So if you’re unhappy with the 1080’s move to the Fresh Foam platform, consider the 880 V6 as your fall-back option. 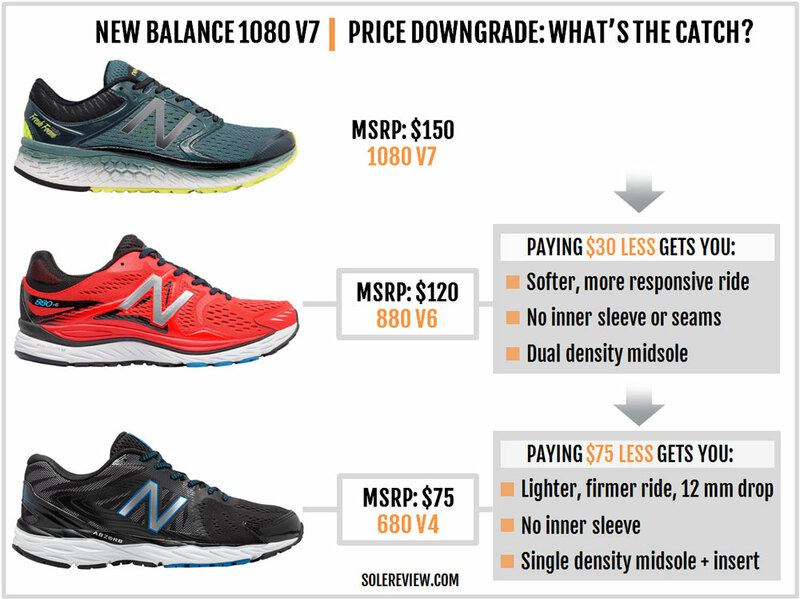 At an MSRP of $75 is the New Balance 680 V4, which is a trickle-down version of the 880. It is a lightweight, budget neutral trainer with a lot of value; the upper is mostly no-sew, and the single-density outer midsole has a softer foam insert. While it rides firmer than the 880, there’s enough cushioning to go around.